Over the past year, I expect I’ve passed well over 500 hundred of this sort of truck hauling this sort of load. 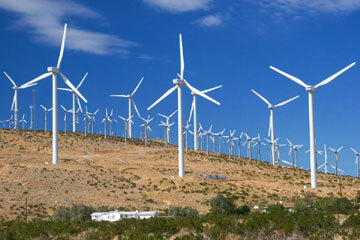 I’m almost sure that I’ve been seeing blades for wind turbines, the devices that produce electricity from wind. They’re shaped a little differently from the blades I’m familiar with, but I can’t figure out what else I am seeing. When I moved to Texas last year, I drove through West Texas, where I was surprised to see acres upon acres of wind farms. I must confess that, as a Californian for most of my life, I figured that Texas as an “oil only” energy state. Thus I wasn’t expecting lots of wind farms. Well, I discovered, even more to my surprise, that Texas gets more electricity from wind than any other state, almost doubling the amount of wind-power generated in California. 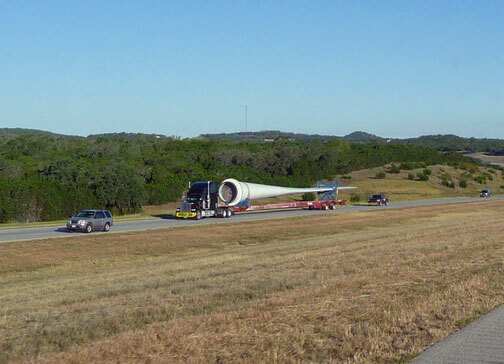 Moreover, Texas has the largest windfarm in the world. So much for my California green pride and bias against Texas! This state is leading the way in developing alternative energy sources. Who’d a thunk it? Forgive the typo on energy word Can tell have not had any coffee here in early Calif. morn. My Bad Thanks Again! Hah! I was born and raised in Sweetwater, TX (now live in DFW) and that windfarm is a welcome addition to the local color. Thankfully, now the town can be known for the World’s Largest Windfarm alongside the World’s Largest Rattlesnake Round-Up! What I find most amazing is the size of these things. You see pictures of the turbines on a hill and you have so little indication of scale. Your picture of the turbine blade really helps. Here’s another I found that shows how huge these things really are.